Pants and cloth diapers, let's talk about fluffy butts! 1. 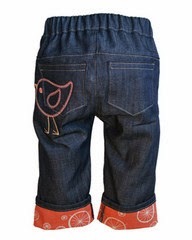 Pants made for cloth diapers! There are pants made especially for cloth diapers! These pants have a bit more room in the back for the fluffiness of you diapers and are a guaranteed fit! 2. The stretchier the better! Using leggings or other stretchy pants will help keep your little one's diaper covered. Jeggings are a great option, especially for baby girls! If you find that your child's normal clothing size isn't cutting it, go up a size and just roll up the legs if needed. 4. Use a trimmer insert! Make a change with your diapers. Use an insert that is equally (or more) absorbent, yet trimmer! Hemp is a great solution! Do you find that dressing your baby in the cooler months is harder with your cloth diapers?